Always wanted to try your hand at Horse riding? With the unique combination of a bustling metropolis in close proximity to exquisite and varied nature, horse riding in Cape Town is the perfect place to start. In under an hour, and just a few kilometers from the city centre, you can mount up surrounded by fynbos and rolling landscapes, ready to make memories. Be mesmerized by spectacular views in and around one of the most beautiful cities in the world by horseback, while relaxing into the wide open spaces of beaches, vineyards and grasslands that the hug the city. Whether you are an adrenaline seeking explorer or simply want to enjoy soaking up the scenery on a gentle stroll, horse riding is the perfect activity for any able bodied adventurer! Exploring Cape Town by horseback doesn’t need to cost the earth. That’s why we have scoured the web and even tried some of the best-rated horse riding experiences to give you this comprehensive list of of affordable horse riding in Cape Town and its surrounds. With an array of spectacular locations available for horse riding, South Africa offers picture perfect experiences from romantic horse riding adventures to Cape winelands riding tours. Perhaps the most noteworthy of them all is horse riding on the beach. Saddle up and explore the pristine stretches of white sand on your horse, prices dependent on the length of the ride you choose. The long, flat beach of Noordhoek, or Long Beach, with its pale waters and gusts of sea spray and sand, has an isolated and adventurous feel. Its size, 8km, also makes it perfect for horse riding. Incidentally, Noordhoek is one of the only horse-friendly beaches in the city. You can trot along the gushing waves, dip your feet in the icy waters, admire the local birdlife on the seasonal lagoon and explore the Kakapo shipwreck from another era on the far end of the beach. 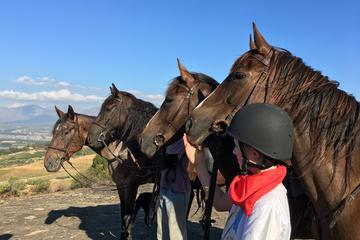 There’s a reason Sleepy Hollow Horse Riding is so popular; the horses are selected according to the rider’s experience and the staff is knowledgeable and passionate about horses. A two-hour horse ride on Long beach is pure magic, through fynbos, wetlands, sand dunes and flanked by salty ocean swell. The Dunes horse riding stables is another reputable outfit for horseback riding on Noordhoek beach and the ocean around Noordhoek is sometimes visited by dolphins and whales, so keep an eye out! Another option for Noordhoek beach rides, Imhoff Equestrian Centre in Cape Town caters for all levels of experience. As they are based in Kommetjie, the horseback trail starts on their farm and meanders through the wetlands for about 20 minutes before arriving on Noordhoek beach. There are usually two guides on a trail, allowing the more experienced to canter ahead while beginners walk along the shores in good company and safe hands. Your knowledgeable guides will talk about the environment and any animals you might see on your journey. These rides take approximately an hour and forty-five minutes and depart thrice a day. On your return to Imhoff, there’s the option of a well-deserved lunch or tea in the restaurant or café, as well as a visit to a snake park! Discover why Cape wines are so loved and are being served across the globe for centuries. Horse rides through Cape Town’s famed vineyards are quite popular and make for a more relaxed, rustic style of touring and tasting Cape nectar. 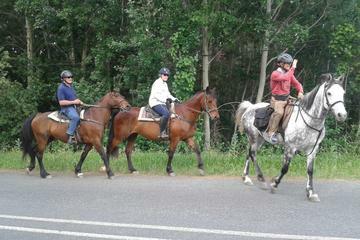 Paradise Cottages and Stables also has wine tasting tours on horseback. Starting from the stables which are situated in Franschhoek (capital of the Winelands), the trail wanders through verdant forests, dry Winelands and over rocky mountains. You can stop at two wine estates for tastings: Mont Rochelle and Rickety Bridge Winery. Founded in 1787, Rickety Bridge offers superb wines to taste in splendid surroundings. On the menu are Sauvignon Blanc, Pinotages, Merlots and more. At Mont Rochelle, there’s also plenty of choices with the likes of Cabernet Sauvignon, Merlot, Shiraz, and Chardonnays making appearances. These can be tasted in the century-old cellar, the bar or the restaurant if you fancy a lunch break. 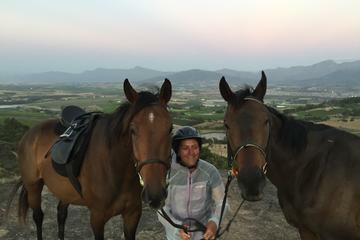 Your guide is a thoroughly experienced professional horse rider for South Africa and will tailor the ride to your experience. The rides, which are on beautiful purebred Arabian horses, last about four hours, with forty-five minutes spent at each winery. Cape Winelands Riding offers a wine tasting route. After a peaceful meander through the vineyards and orchards, you’ll arrive at Backsberg Wines for some tastings. There’s a wide variety of Sauvignon Blancs, Chardonnays, Merlots and Shirazes, amongst others, for you to select your golden five tastings. Don’t worry ‒ it doesn’t end there. The route back to the stables is brand new and sublimely beautiful. Heading out of the Mother City, Wine Valley Adventures offers carriage rides in the Stellenbosch/Paarl region. Their specialty is incorporating wine tasting into the rides. A favourite option is the Picnic Carriage Trail which includes one wine tasting, a carriage ride and a picnic. A Cape Town safari day trip on horses is a better alternative safari option to experiencing the natural wonders of Africa. Stalking game gets closer than ever when you’re saddled-up and ready to ride. No experience is necessary for the Aquila horseback safari day tour. Seeking your very own fairy tale experience? It’s possible with romantic horseback riding through the scenic Paarl Nature Reserve, flanked by view of the Du Toits kloof mountain range and surrounded by breathtaking natural beauty. Stroll off into the sunset in seek of a moonlit horse riding adventure and with sundowner snacks and drinks at Wine Valley Adventures . These rides begin at Rhebokskloof Wine Estate in Paarl and meander into the Paarl Nature Reserve. The views, of the farming plains, the surrounding mountains, and iconic Table Mountain, are spectacular. This guarantees a romantic date! If you’re looking to spend some more quality time with your loved one, try one of the overnight horseback riding trips on offer. You can spend the days riding in pristine natural environments, picnicking in shady spots along the way and sampling splendid Cape wines; the nights can be spent at secluded luxury establishments. There’s not much more to paradise than this! These horse riding trails happen around Cape Town, extending up to Stanford and the Elgin Valley, and are custom-made according to budget, skill and time. For an extravagant weekend away, the Multi-Day Beach and Mountain Trail at Horse Riding Cape Town answers all your desires. You are provided with three nights of luxury and two days of tranquillity. In a couple of days on horseback, you’ll experience a diverse range of landscapes. These include the Walker Bay Conservancy with the scent of fynbos wafting around you, endless shores where waves crash in eruptions of sea spray, sandy dunes littered with small bushes, mountains, dams, vineyards and other farms. Highlights include a spot of swimming in a farm dam with your horse and concluding each day’s journey with a seaside dip! Between July and November, you may even be lucky enough to spot a few whales! Along the road, you can stop for some wine tastings on the splendid Springfontein and Lomond wine estates and enjoy everything from a Shiraz to a Chardonnay. Every evening is characterized by delicious food, comfortable rooms full of beauty and candlelit baths for you and your loved one. With such a package in hand, no-one could say you aren’t a romantic! If horse riding is your passion, then an equestrian party is probably a dream come true. There are different sorts of horse riding birthday parties possible in Cape Town, from trails in the vineyards to carriage rides and picnics while your horses graze. With such a variety of options, a horse riding party in Cape Town is not only for kids! Considering a fun-filled pony party package, tailored for kids? Children get to not only ride a horse but also learn how to look after it. Your guests can enjoy a party programme of learning to groom and saddle a horse, riding it in the area, and unsaddling the horse before finally enjoying party snacks of chips, sweets, cupcakes and cool drinks. What a perfect party for any prince or princess! A great idea for parties is to take a horse ride at Oude Molen stables and then find a beautiful, shady spot to have a picnic. This suits any age and provides structure for your event. You could ride astride one way and in a carriage on your return. To give your event a grander atmosphere, consider making your horse riding party part of a theme such as vintage or Jane Austen. Your guests can dress up and enjoy the otherworldly vibe of parasols, horses, and carriages! Oude Molen horse riding Pinelands offers cart rides, in addition to horse riding trails, providing two fun activities for your horsey party! Oude Molen is conveniently situated only 10 minutes from the city centre. There are lovely views of Table Mountain from this historic site, where the Khoi grazed their cattle and the Dutch farmed. You’ll also get the gift of knowing that your party helps to support this community eco-village which supports the local community in a sustainable way. If you opt against a picnic, there’s always the onsite café to host the cutting of your cake! The premises were once home to a mental asylum and a military barracks in the past! With so many different locations and different packages, Cape Town’s horse stables are suited to everyone’s desires. Offering so much more than just a quick trot around, they can take you to some of the city’s most iconic natural environments and help you to taste true Cape hospitality. 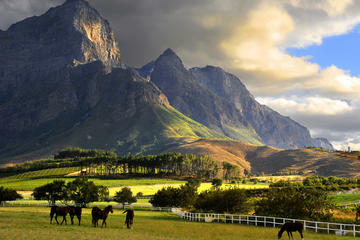 Your experiences of the Winelands and the beaches will be so much more enriched by your lofty position on horseback. With the added options of horse riding parties and overnight romantic getaways, there’s a horse ride in Cape Town for every occasion! Enjoy the Cape's awe-inspiring natural beauty, from horseback!